The road between Mammoth Hot Springs and Norris Geyser Basin will open to cars as scheduled Friday, April 20, 2018. More information on Yellowstone road conditions is available here. We previously reported that the Mammoth-Norris route might stay closed due to poor conditions. An ongoing construction project between Willow Park and Roaring Mountain means portions of the road are unpaved. At last report, the road was too muddy and rutted for cars to drive on. Since that announcement, crews have worked to make the road passable. 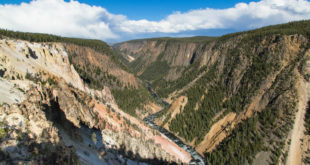 In the event that the Willow Park-Roaring Mountain stretch remained closed, visitors would still have been able to drive from Mammoth Hot Springs to Willow Park. Drivers along the Mammoth-Norris route should expect up to 30-minute delays. In addition, some boardwalks at the Mammoth Terraces and Norris Geyser Basin may be too snowy to walk on. Please check in at the nearest ranger station for boardwalk conditions. • Old Faithful Snow Lodge Geyser Grill (April 20). • Old Faithful Visitor Center (April 21). You can see the full list of opening and closing dates here.